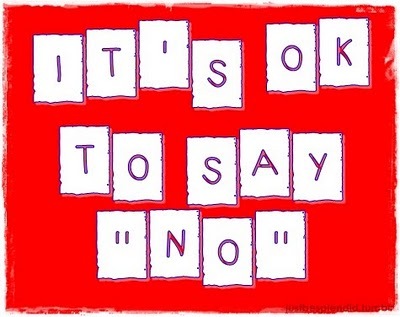 Yes, you can STILL say “NO”! My client Jenny had been invited to live in a shared house with a work acquaintance, Fiona. The lease wa s coming up on Jenny’s unit and the rent was going up way past what she could really afford, so when Fiona made the offer, it sounded like the answer to her prayers! A big house with lots of natural light, someone who she worked with, in a suburb that she really liked AND, she would be saving heaps of money. So, she said “yes” to Fiona, gave notice to her real estate agency and started planning the move into the shared house with Fiona and her boyfriend, Garry. Fiona was SO excited! She and Jenny spent many lunch breaks talking about how great it was going to be, all the things they were going to do and how they were going to spend the extra money they would all save. But as the move got closer, Jenny started to feel increasingly anxious about it. When she visited the house, she noticed that Fiona and Garry were really social. They had lots of friends who liked to drop by and talk for hours which was not something Jenny really enjoyed. After a long day at work, all Jenny wanted to do was relax, watch tv, have dinner and go to bed. Fiona was really lovely but SO full on! At work and at home, things had to be HER way and Jenny found her increasingly difficult to deal with and as Garry adored her, Jenny could see how she would end up with very little say about how they lived. The more Jenny thought about moving day, the more she began to feel that she had made a horrible mistake. Fiona and Garry were nice people, but SO different to her and what seemed initially like the answer to a prayer, was beginning to turn into a nightmare. Jenny didn’t want to move in with Fiona and Garry, but because she had said “yes”, she felt trapped and she had no idea how to get out of the situation. Instead of feeling excited about the move, she was anxious, sick and full of dread at how she was going to manage living with Fiona and Garry when deep down, it was the LAST thing she wanted to do. By the time Jenny came to see me, she was anxious, teary and feeling constantly sick in the stomach. She knew she did NOT want to move in and she would be much happier finding a place on her own, but she just didn’t see how she could say no to Fiona now. After all, she had agreed. She was worried that Fiona and Garry would be really angry with her and how it would affect her relationship with Fiona at work and what Fiona would say about her to people they worked with. She was worried that sharing the house with them was going to be a nightmare experience for her and she had no idea how she would cope with it. She was worried about what her family and friends would say if she didn’t keep her word. At the bottom line, Jenny was about to sacrifice herself by doing something she really didn’t want to do because of the risk of potentially upsetting and disappointing someone else. She was making herself sick with anxiety and stress rather than be honest and say that she had changed her mind and didn’t want to move in anymore. She was putting Fiona and Garry’s feelings ahead of her own and paying the price for it. When you say “yes” to something that you really don’t want to do, you are ALWAYS saying “no” to yourself and you WILL pay the price. You pay the price in feelings of anxiety, resentment, depression, frustration and loss of self esteem. The price you pay also takes it’s toll on your relationships because all of those feelings will come out, sooner or later. Here are the steps to saying “NO” even if you have already said “YES”. Be really clear about what you want and why. In Jenny’s case, she knew that she needed her own space and privacy because that’s what makes her feel comfortable. Honor yourself and put your own needs first. Selfish? NO! it’s essential! This is your life and if your feelings are NOT more important to you than other people’s you WILL find yourself in a pattern of people pleasing and self sacrifice which WILL make you feel miserable. Don’t confuse being true to yourself with compromise. Compromise which is an essential part of life and relationships, means that both people find a solution they can live with, not one person sacrificing their own needs and feelings for the other. DON’T assume that you know what will happen. The truth is that we project our fears and the “worst possible outcome” onto any situation where there may be conflict. Focus on what you want and speaking your truth. Prepare your conversation. In this case, I helped Jenny come up with a way to tell Fiona the truth about what she wanted to do, in a way that honored herself, kept her integrity and was kind. We did lots of work on Jenny’s assertiveness skills and increasing her confidence so that when she had the talk with Fiona, she was nervous BUT she felt that she was doing the right thing. Initially Fiona was upset and disappointed but as they talked it through, Fiona confessed that Garry would be relieved as he had been having concerns about how having Jenny living with them could affect their lives. Jenny found the perfect place that she could afford AND gained so much confidence in her ability to honor herself and say “no”. Need help setting boundaries or saying no? Come on over to www.lovetransformslc.com and discover how working with me will get you saying “Yes” to the things that matter to you. This entry was posted in Uncategorized and tagged assertiveness, conflict, relationships, saying no by dietfreebody. Bookmark the permalink.